How has currency in circulation behaved in India? 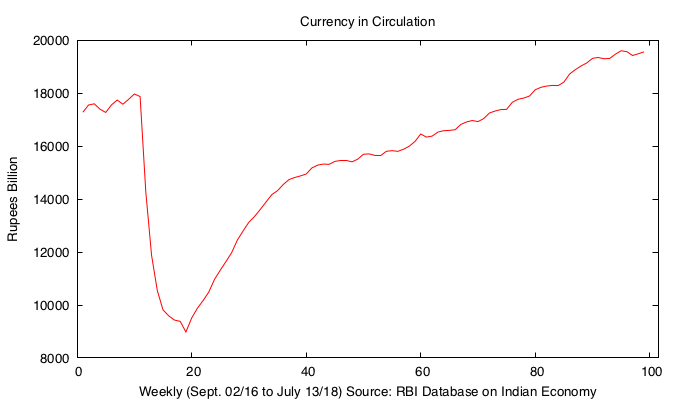 The following graph represents the behavior of currency in circulation in India over the past two years following the demonetization announcement on November 8, 2016. The giant dip you notice is immediately following the announcement that rendered Rs. 500 and Rs. 1000 currency notes illegal. They contributed 86% of currency in circulation at the time. It took about two years for the currency in circulation to be back at the pre- demonetization level. I reviewed the book Monetary Policy in India: A Modern Macroeconomic Perspective edited by Chetan Ghate and Kenneth M Kletzer, Springer, 2016 for EPW recently. Overall, the articles in the book represent a significant and substantial contribution to the literature on monetary policy of India- definitely from the point of view of application of dynamic macroeconomic models to the policy environment of a typical developing economy. NPR’s Planet Money did a two part podcast on Anil Bokil and his organization Arthakranti who convinced Prime Minister of India Mr. Narendra Modi about demonetization as a solution to India’s poverty, corruption, and black money related problems. This was back in 2013 when Mr. Modi was Chief Minister of Gujrat. Arthkranti is a plan conceived by some accountants and engineers to curb corruption and improving tax compliance in India. According to them, limiting the use of cash is one of the solutions. I have already talked about what is wrong with this solution here, here, and here. I also wrote a critique of Arthakranti proposals few years ago while I was grad student and did not think that anyone would take these proposals seriously! Nonetheless, it is interesting to hear what Mr. Bokil has to say. NPR guys did a good job here. I thank J P Konning for making me aware of this podcast through one of his tweets. My paper on Demonetisation is now published at the Economic & Political Weekly as Demonetisation through Segmented Markets: Some Theoretical Perspectives. The downward revision of Q3 F16 growth is pushing up the growth estimate for the current quarter. This downward revision could be because of poor agricultural growth in 2015-16. Pile up of inventories in the distribution channels could have been recorded as increased consumption expenditure. This is the channel stuffing phenomenon where the wholesalers pushed goods down the distribution channel still probably expecting the sales to revive after remonetisation. The rich may have spent on big ticket commodities like cars. For e.g. Maruti Suzuki recorded some increase in revenue pushing durable consumption expenditure up. The official GDP estimates don’t really measure informal sector activity with accuracy and it is the informal sector (unconnected households and firms) that has been hit very hard by demonetisation. If the above reasons are true, then the growth estimate would most likely be revised downward later as data catches up with the decline in economic activity. However, for now the BJP government and Prime Minister Modi could take all the credit for the improved growth and boost their political capital when it matters given the UP elections. It is partially based on an earlier blogpost on the same topic. Read my latest paper on the Great Indian Demonetisation Experiment here. The analysis is based on a simple textbook version of a segmented markets model (Williamson 2011). I prepared this is as a teaching note and therefore is fairly non-technical. The reference to an older edition of Williamson’s brilliant text is because the segmented markets model has been dropped from its subsequent editions to accommodate latest macroeconomic developments in the developed world. Williamson S (2011), Macroeconomics, Pearson. How to keep the American Dream intact? I think this measure of the fading American dream provides an incomplete narrative of what might be happening in the US today. Given, that per capita incomes were much lower in 1940s compared to today and that economic growth rate measured by growth in per capita real GDP has stayed constant over this period at 2 percent per year (see graph below), it seems obvious that children born later would face a lower probability of doing better than their parents than children who were born in earlier decades. I think the story of decline in absolute mobility is invariably linked with the nature of growth process in the US. Today there is an unprecedented increase in the skill requirement on an average to produce 1 unit of real GDP than in 1940s. Also, aging population means that there are less people who can acquire those skills. If this is coupled with a simultaneous rise in required time for skill accumulation, then at any given point in time we might see an increase in the proportion of people working part time reducing the probability of earning more than your parents. See Acemoglu and Autor’s Handbook chapter for skill biased technological change and its impact on the US labor market. When looked at in conjunction with these changes in the American economy, we get some interesting policy implications. One, there should be more spending on education- given the importance of ideas for economic growth in future, the case for education having diminishing returns is already weak. Second, have more skilled people come in through immigration-directly as workers or indirectly as students- which can help increase the size of economic pie while people born in the US get the required time and money for education. Third, there should be a change in the way we approach education in order to foster life long learning capabilities in those being educated. Fourth, Redistribution-More public spending on education also means more redistribution, something that the paper finds reverses the decline in probability of earning more that your parents.